Expert sliding glass door repair service in West Palm Beach, Express Glass & Board Up, has announced a timely hurricane preparedness page to help Florida residents survive high impact winds in 2017. With Hurricane Irma clean up in full-swing, the company is drawing attention to long-term Hurricane preparedness as well as emergency glass repair. Express Glass & Board Up, specialists in emergency sliding glass door repair in West Palm Beach, is proud to announce a timely alert on hurricane preparedness, including so-called 'hurricane glass' or 'impact-resistant glass.' With Hurricane Irma repairs in full swing, the company is reminding people not only of its position as the #1 emergency glass repair service in West Palm Beach but also the need for a long-term hurricane preparedness strategy, including impact-resistant glass. To review the new Express Glass hurricane preparedness page visit; http://www.expressglassfl.com/blog/glass-repair/west-palm-beach-hurricane-glass-glass-repair-hurricane/. To review the updated page on so-called hurricane glass or impact resistant glass see http://www.expressglassfl.com/hurricane-preparedness/. Hurricane Irma has been called the first large storm of the 2017 season to hit Florida; there may be others, however. Here is background to this press release. Residents in Texas have begun to recover from Hurricane Harvey just as Florida residents are now beginning the recovery process from Hurricane Irma. West Palm Beach residents may be wondering how to lessen the impact of future powerful Atlantic storms, as hurricane season is far from over. Beginning with a smart hurricane preparedness checklist could be a good first step. Evaluating the home for areas where wind and water can break through can help pinpoint weaknesses. Areas of concern can include windows and glass doors. Sliding glass door repair planned before and after a catastrophic hurricane could help lessen the negative impact on a property. For the short term, Express Glass is issuing this alert so that West Palm Beach residents realize that the company is a leader in emergency glass repair for West Palm Beach, Fort Lauderdale, and Miami. For the longer term, residents looking to make a plan of action may review the time-sensitive web page on hurricane preparedness. If window and door glass can be evaluated prior to a storm, installing high-impact glass could help. Pre-planned emergency sliding glass door repair and window replacement for a catastrophic storm could shorten recovery time. Reinforced glass and well-sealed windows, along with board up service, can help withstand the impact of flying debris. Locals could be concerned about how to prepare for a powerful tropical storm and keep properties safe. A strong hurricane preparedness plan, including emergency sliding glass door repair in West Palm Beach could have a positive impact on storms that come after Hurricane Irma. Express Glass and Board Up Service Inc. is a family owned and operated glass repair business with more than 20 years of experience. Professional technicians and the large variety of inventory make Express Glass the top glass repair service. 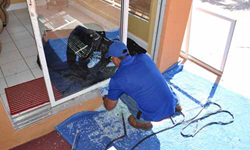 If customers are looking for West Palm Beach window glass repair as well as glass repair in Delray Beach or Miami glass repair, please reach out to the company for a free estimate. If customers need a 24/7 Sliding Glass Door repair service in West Palm Beach or Boca Raton or Miramar, technicians are standing by. The company specializes in sliding glass door repair and window glass repair; technicians will handle any glass replacement situation efficiently. Home or business glass repair is the company's main priority.